1. What is causing the GMP low liquid level cut-off alarm to go off? The GMP probes measure the electrical continuity of the fluid. Premixed glycol/water often uses deionized water, which, along with glycol, have very low conductivity. The sensitivity of the probes can be adjusted by removing the motor starter control cover. Adjust the potentiometer counter-clockwise until the alarm shuts down. An alternate “fix” is to increase the conductivity of the glycol/water mixture by adding 1-2 gallons of tap water to the solution container. 2. What is causing the GMP system pressure to build up? If the pressure continues to increase beyond the PRV setting at startup (or with the system shut down), the pressure reducing valve has dirt or other debris that is holding the valve slightly open. The internals of the PRV can be easily removed and cleaned. 3. What is causing the GMP motor/pump to short cycle? Check the integrity of the small pressure tank (expansion tank) located on the bottom portion of the steel frame and inspect the system for any leaks. Also, check the Pressure Reducing Valve (PRV) for leaks and clean if necessary. Finally, check to make sure the pump vane is not damaged if pressure fails to build up. 3) Remove air-charge valve cover on the back of the bladder tank. Depress the valve stem. a) If fluid comes out, the bladder is torn – replace tank. b) If no fluid comes out and little or no air comes out, the tank must be pre-charged to the factory setting of 45 PSIG. NOTE: the tank must be empty before pre-charging to 45 PSIG. If the GMP is isolated, and if a drain or union was installed, remove the fluid from the GMP. The bladder tank may need air pressure to “push” the fluid out. Once the fluid is removed, air-charge the tank. NOTE: If air comes out of the water side connection, the bladder is torn and the tank must be replaced. c.) If air comes out, measure the air pressure in the tank. The tank should measure 80 PSIG (approximate +/- 5 psi). A truck tire gauge with a greater readout range is recommended. The tank air may have still lost some air cushion, resulting in a reduced capacity, water-logged tank. The air pre-charge should be checked and adjusted. The tank must be pre-charged to the factory setting of 45 PSIG. NOTE: the tank must be empty before pre-charging to 45 PSIG. If the GMP is isolated, and if a drain or union was installed, remove the fluid from the GMP. The bladder tank may need air pressure to “push” the fluid out. Once the fluid is removed, air-charge the tank. NOTE: If air comes out of the water side connection, the bladder is torn and the tank must be replaced. 4) With the air pre-charge adjusted to 45 PSIG, turn power on to the GMP and observe that the pump cycle time has increased. Set the GMP pressure reducing valve to the required fill pressure. Open the ball valve to the system. 4. What is causing the GMP motor/pump to stay on? The pump is designed to deliver glycol to the bladder tank to 80 psig then shut off. If the pump continues to run, either the glycol is going somewhere else, or the pump is not reaching pressure. A simple test is to isolate the GMP from the system (turn off ball valve to the system). 1) If the pump shuts off, check the pressure at the air valve of the GMP bladder tank. This should read 80 psig (+/- 5 psi). If you are at this point, the GPM is operating as designed. The reason the pump remains on when the ball valve is open is that the glycol is being pushed into the system. The likely “culprit” is the system expansion tank. If the system expansion tank is set for a lower pressure (say 12 psig) and the GMP pressure regulator (PRV) is set to a higher pressure (say 20 psig), the pump will continue to run, pushing fluid into the system expansion tank. The system expansion tank pre-charge pressure (with no fluid in the tank) must be set to equal the GMP pressure reducing valve setting. i. A shear coupling (plastic) is used between the pump motor and the pump. Its function is to shear or break if the pump binds. If this occurs, replacement parts are available. If the pump moves relatively freely, the shear coupling may only need replacing. If the pump does not move freely, it may need to be cleaned or replaced. ii. The pump used is a rotary type. If the internal vane mechanism is compromised, the pump will have to be replaced. iii. The pump incorporates an internal pressure relief valve. The relief valve bypasses fluid to the pump suction to keep discharge pressures from continuing to potential unsafe high levels. The pressure relief is a spring loaded set-screw located on the pump side. It is recommended that the pump be replaced if this condition occurs. 5. What is causing the GMP solution container to drain rapidly upon start-up? 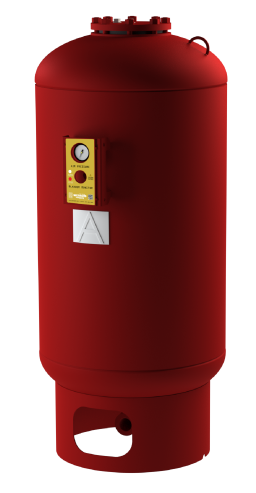 The small pressure tank (expansion tank) pre-charge may be set incorrectly and need to be reset. The pump is designed to deliver glycol to the bladder tank to 80 PSIG then shut off. If the pump continues to run, and the glycol level in the solution container continues to drop, the glycol is going somewhere else. The glycol is being pushed into the system. The likely “culprit” is the system expansion tank. If the system expansion tank is set for a lower pressure (say 12 PSIG) and the GMP pressure regulator (PRV) is set to a higher pressure (say 20 PSIG), the pump will continue to run, pushing fluid into the system expansion tank. Isolate the GMP from the system (turn off ball valve to the system). The system expansion tank pre-charge pressure (with no fluid in the tank) must be set to equal the GMP pressure reducing valve setting. This means all the fluid from the system expansion tank must be drained prior to adjusting the tank’s pre-charge pressure. 6. How do I check and set my tank precharge? All Wessels expansion tanks come factory precharged to 12, 30, or 40 PSIG depending on the model, but this may not be the correct setting for your installation. To check the precharge, the tank must be isolated from the system and emptied. Remove the pipe plug covering the valve enclosure and attach a pressure gauge to measure the pressure. Release air to decrease pressure or add compressed air (oil and water-free) or nitrogen to reach your installation’s design fill pressure. 7. How can I tell if my tank bladder has failed? Press the air valve release. If water comes out of the air charge valve, the bladder must be replaced. If water does not come out of the air valve, isolate and drain your tank. Set the precharge and check if you are losing pressure out through the waterline. If you discover air escaping through the waterline, replace bladder. 8. Why won’t my tank hold its precharge? You may be experiencing an air leak. Isolate and drain the tank and then precharge the tank to system pressure using the air charge valve. Apply a soap/water solution around the air charge valve, the space between the top cover and tank head, all plugged tappings, along all of the weld seams, and on the bottom head at the system connection. Bubbles will indicate if the air leak is caused by an improper seal or weld. If there are no bubbles and the tank still does not hold an air charge, please review question #7 above. 9. How do I replace my tank bladder? For detailed instructions on how to remove and replace your tank’s bladder, please click the links below or watch the short instructional video Wessels Expansion Tank Bladder Installation. 10. What types of fluids can I store in my bladder tank? Bladder tanks are typically used for hydronic (water) applications or water-glycol mixtures. For other fluid compatibilities, please contact us. 11. What is tank draw-down? Tank draw-down volume is the amount of water (typically in gallons) that is stored between a high and low pressure, usually set by a pump switch. Tank draw-down is also called Acceptance volume, which is the volume of water in a tank and is sometimes expressed as a multiplier against tank volume called an acceptance factor. Tank volume is the overall tank volume including air and water. 12. Does the flow orientation for the WVA matter? The WVA is designed to be omnidirectional so the inlets and outlets can be swapped without affecting performance. 13. What size tanks does Wessels manufacture? Wessels Company manufactures tanks up to 144 inches in diameter and 50 feet long. 14. Are Wessels tanks UL listed? Tanks can be manufactured to UL requirements, but are not UL listed. 15. Are Wessels tanks NSF61 certified? Wessels Company manufactures with NSF61 listed materials including stainless steel and NSF61 certified Butyl bladders. All wetted parts conform to and are listed NSF61. 16. What is ASME Specification? The American Society of Mechanical Engineers (ASME) is a professional standards organization that sets technical guidelines for mechanical manufacturers, engineers, designers, and equipment operators. Wessels Company is proud to be an ASME certified manufacturer of pressure vessels and custom tanks.